Family traditions are a wonderful thing. The holiday rituals we share with our loved ones bring us together and help us create fond memories. For many Canadians, Thanksgiving is an opportunity to reconnect with family, enjoy quality time together and reflect on all the things we can be grateful for – and it’s even better if we can celebrate over a delicious turkey dinner. Family traditions endure for many years, often decades. Inevitably, however, traditions must evolve as a family’s generations grow, change and age. 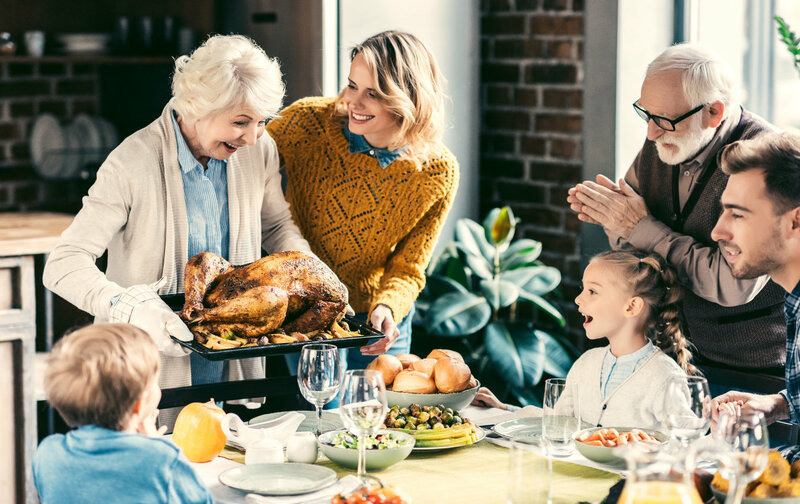 Maybe the elders in your family have hosted Thanksgiving dinner for as long as you can remember, but they no longer have the energy or mobility to manage a huge feast. Perhaps they’ve downsized to a smaller home that’s not suitable for big gatherings, such as an apartment or assisted-living facility. Adapting to new circumstances makes sense, but it can still be emotionally painful to let go of beloved traditions. “Thanksgiving dinner won’t be the same if it’s not at Mom and Dad’s house,” you might think. Coming up with new and creative ways to celebrate with senior loved ones can help everyone adjust – and keep the focus on family togetherness. Traditions can change slowly or suddenly, depending on what’s happening in your family. The key is to keep an open mind and be willing to try new activities. Encourage your family members to do the same. Things may not go perfectly as planned, but that’s okay – try not to put pressure on yourselves to create the perfect celebration. Ask what’s important: Talk to your senior loved ones about what’s most meaningful to them for Thanksgiving and other holidays. It might be sharing a meal with extended family, seeing their grandchildren, attending a religious service or spending time outdoors. Perhaps viewing the changing fall colours is a new activity you can do as a family. Thanksgiving dinner: A traditional turkey feast once prepared by a few family elders might turn into a potluck with dishes contributed by the younger generations – or it might become a catered dinner or a night out at a restaurant, so no one needs to cook. Perhaps the celebration will no longer involve a turkey and all the trimmings, but trying new options can be fun. Visiting your loved one: If your senior loved one has developed an illness or a disability that prevents them from contributing to or attending celebrations, find other ways to involve them in family activities. You could, for example, bring dinner to their assisted-living facility or hospital room and spend a few hours together. If their residence holds holiday events, you could attend them together. Try to visit on Thanksgiving itself, so your loved one is not alone on the holiday. Cooking together: If your loved one lives in a retirement home with a shared kitchen, find out if you can prepare food there. That could mean making lunch or dinner, or baking cookies with the grandkids. Get creative: Ask family members, including children, for ideas on spending time with their elders. For example, some families enjoy watching movies, going to live shows, looking at photo albums, baking, putting up holiday decorations, making crafts, playing games, attending community events or singing songs together. Take advantage of technology: If it’s too difficult for your loved one to go out, or if family members are too far away to visit, you could use video chat to connect. Skype and Google Hangouts are free options. Arrange a time to talk with relatives, and bring your tablet or laptop to your loved one’s home. Whatever you decide to do this Thanksgiving, you can make it easier for both yourself and your loved ones by planning well in advance. If you’re bringing your loved one to dinner at a family member’s house, for example, allow enough time for them to get ready and travel to your destination without feeling stressed or rushed. During holiday celebrations, check in with your loved one frequently to ensure they are comfortable and not getting too tired or overwhelmed. Be prepared to take them home early if necessary. If you or your family need a little extra help over Thanksgiving or other holidays, contact Bayshore Home Health at 1-877-289-3997. We have 65 home care offices across Canada, and services include personal care, nursing, respite care, transportation and more.